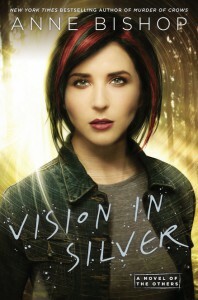 VISION IN SILVER is the third book in Anne Bishop’s brilliant The Others series. In this series Bishop has moved from high fantasy to urban fantasy/paranormal romance; and she does it well. There are repercussions for the events in MURDER OF CROWS which are far reaching. Meg is the only one who can help with one situation, but it means putting herself in danger something her friends oppose as it means she must put her own life at risk. VISION IN SILVER was everything I expected from a book in this series. Once I picked the book up I was sucked straight back into Bishop’s world of the Others, where humans are not the ones in control. It was easy to remember the politics and the events of the previous books, and it never felt like Bishop was prompting the reader. For me, this book was a real page-turner: I had to know what was going to happen next, where the next twist was going to lead. I was sorry when I came to the final page. Not because the story was lacking in any way, but because I know I’m going to have to wait about a year for the next part – and I want to know now! I really enjoyed the return of familiar faces, and the appearance of new characters in this book – even the baddie seemed interesting. I cannot go further in this book without saying how awesome I think Meg is, and how brave she is in this book – and in this series. I also enjoyed the return of Simon, and his struggle between his own nature and the things he has learnt since Meg’s arrival. The police were great as always, I especially admired Burke and Kowalski. The new characters added a new depth to the narrative, and also expanded it. The focus of the narration of the book is of course split though the main focus is on Meg and Simon and the bad guy, like the previous novels. I thought the multiple narrative focus really worked, as it enables a larger view of the events in the book. I also liked the different insights it provided about the events of the novel – it was really interesting to see how one set of characters saw something, compared to another. It really served to show the different thinking between the main groups – Other, cassandra sangue, human – which is, I think, one of the overall themes of the series. I also really enjoyed the fact that there are multiple plot threads in the story, and I found them all easy to follow and really quite interesting. This book seems to be a real tipping-point within the world, and I cannot wait to see what’s going to happen in future books.